Skin Cancer is the medical term for the uncontrolled growth of an abnormal type of skin cell. This occurs when the DNA of the particular skin cell has been damaged, usually from UV light, which results in a cell that is a mutant of the original parent cell and it does not behave in a normal manner. Skin cancer cells divide and multiply more rapidly than normal skin cells. They also lack the protective function of normal skin cells so that a skin cancer tends to bleed or weep easily. Skin cancers may extend and destroy nearby tissue, and some are able to spread to vital organs where they establish a secondary cancerous deposit which can become deadly. There are three main types of skin cancer. Basal Cell Carcinoma (BCC), Squamous Cell Carcinoma (SCC) and Melanoma. 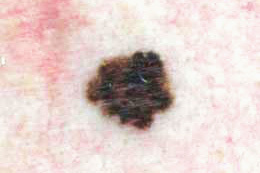 Actinic Keratosis (AK), or sun spot, is considered to be a pre-cursor to Squamous Cell Carcinoma. Bowens disease is a term for an SCC that is confined to the outer layer of skin only, and a Keratoacanthoma is a rapidly growing lesion that shares many features of an SCC. In addition there are many other types of skin cancers and tumours, such as Merkel Cell Carcinoma, Atypical Fibroxanthoma, Microcystic Adnexal Carcinoma, Mycosis Fungoides (a type of white blood cell form of skin cancer) and others. Fortunately these are not common forms of skin cancer. In Australia we have a huge problem with skin cancer which accounts for 80% of all new cancers diagnosed. It is difficult to know the true incidence of non-melanoma skin cancers (NMSC) diagnosed in Australia each year as there are no central records kept. However, it has been estimated that there are more than 450,000 new non-melanoma skin cancers diagnosed with around 500 deaths (mainly from SCC) each year. Melanoma statistics are recorded in state registries, and on average there are 12,000 new melanomas diagnosed, and around 1200 deaths from melanoma per year. Early detection and treatment of skin cancer saves lives.